In the "hadal" zone, which at 11,000 meters is deeper than Mount Everest is high –- the pressure rises to 1,000 bar, or a ton per square centimeter. And as there is practically no light, and plants cannot grow, there is little food. It offers a glimpse of what life on Jupiter's moon, Europa, might look like. A new species of archaebacteria, Pyrococcus CH1, was recently discovered thriving on a mid-Atlantic ridge within a temperature range of 80 to 105°C and able to divide itself up to a hydrostatic pressure of 120 Mpa (1000 times higher than the atmospheric pressure). This discovery was made by an international team of microbiologists of the Microbiology of Extreme Environments Laboratory in partnership with the Institute of Oceanography of Xiamen (China) and the Earth Science Laboratory. This archaebacteria had been isolated from samples by a Franco-Russian team that explored the mid-Atlantic ridge for six weeks searching for new hydrothermal vents. The piezophilic microorganisms constitute a subgroup of extremophiles. 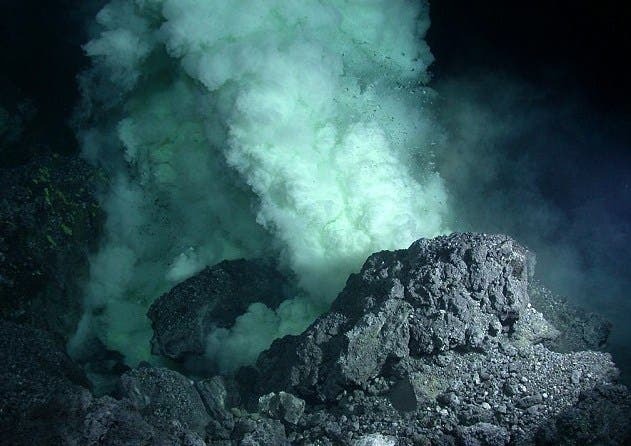 Discovered on the site “Ashadze”(2) at 4100 meters depth, the deepest vent field explored so far, the CH1 strain was successfully isolated and assigned to the genus Pyrococcus, within the Euryarchaeota lineage of the Archae domain. The discovery extends the known physical and chemical limits of life on Earth. The reason scientists believed for so long that life did not exist in the deepest parts of the sea is because the oxygen that filters down is centuries old, having formed near the surface through photosynthesis by microscopic plants known as phytoplankton. Pyrococcus CH1 is only one of many examples of extremophilic microorganisms on our planet, all of which point vividly to what we might eventually discover as NASA's future probes explore the moons of Saturn and Jupiter. Extremophiles are the ultimate adventurers. These organisms thrive where other microbes don’t dare venture: boiling water holes, freezing lakes, and toxic waste dumps. Researchers have sequenced the genomes of two extremophiles that live at the bottom of Ace Lake in Antarctica, where there is no oxygen and the average temperature is a brutal 33 degrees below Fahrenheit. Extraterrestrial life is the most interesting thing ever, bar nothing. We have two possible life-locations right here on our solar system doorstep — but we have to choose which to check. We want to go everywhere, but with a price-tag of billions of dollars per outer-planet probe we have to decide and flipping a coin just won't cut it. Option Number One is Jupiter's Europa, the favored satellite son of many exobiologists and even Arthur C. Clarke himself. While distinctly non-Terran, huge sub-surface ocean –reaching depths of 67 miles– probably heated by tidal stresses, and even an extremely tenuous oxygen atmosphere make it a leading contender. Hot water and even some air? Is there a more likely life-site without tiny bacteria-sized jacuzzis? Number Two is Saturn's Titan, a very-Terran option whose surface lakes, shorelines, seasons and relatively thick nitrogen atmosphere mean it's viewed as an early-model Earth. And 100% of all know Earths have awesome life on them! The significantly lower temperature is a bit of a stumbling block (it's ten times as far from the sun as us), but the possibility of subterranean microbial life — or even a prebiotic "Life could happen!" environment — would be a massive result.